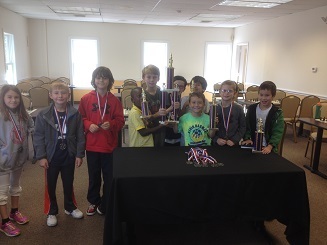 There were many impressive results at this month’s K-8 Scholastic Championships. 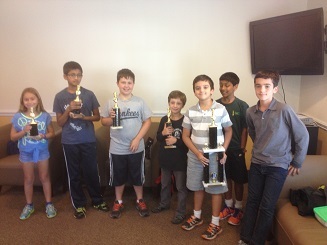 Jack Cole won the K-2 with a perfect 4/4 to push his rating over 1000. 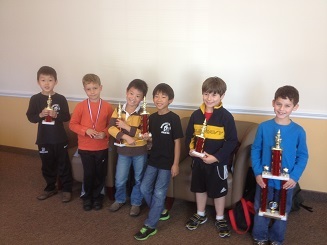 Jack Klein won the K-5 section, the largest by far with 14 players, with another 4/4 score. Finally, it was Shailen Smith who won the strong K-8 section with the third perfect score of the day. Dream Teamers Daryl Lavin, Sean Thomas, Anibal Loureda and Louis Savarese all had good results. Special congratulations to Alexandre Beliard who participated in his first ever rated tournament! Thank you to all the players, who as always, showed impeccable sportsmanship throughout the tournament. There were many instances of players on the losing side of tough games congratulating their opponents on a job well done.